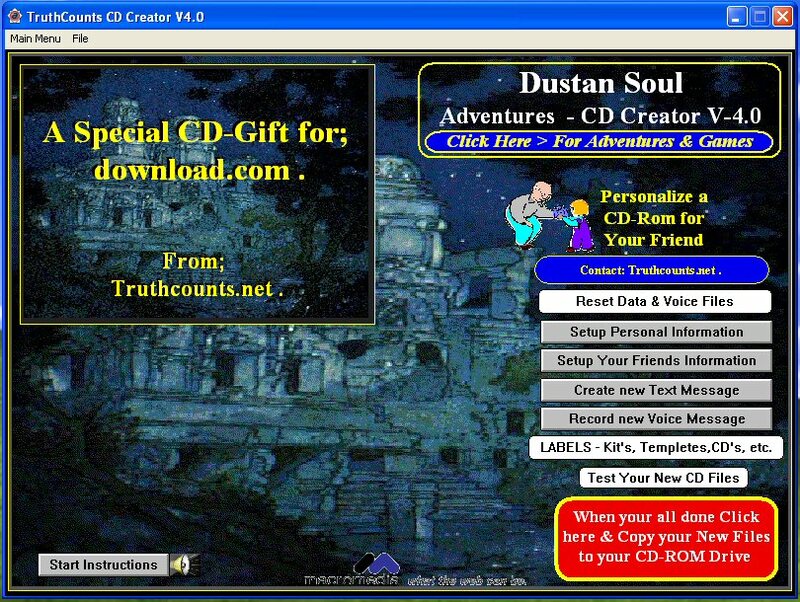 Dustan Soul Adventures is a multimedia, interactive, Fully Customizable Adventure that shares the Gospel of Jesus in a fun and easy to understand format. This program uses Microsoft Accessibility options such as (text to speech, and a built in artificial intelligence, to compares what you believe today with what God tell us in the Bible. It will analyze your understanding of the bible, and direct you to a clear understanding of Gods Plan of Salvation for all mankind. It is designed to fit on a Business Card or full size CDs and it is fully Customizable. You can personalize it for your own Ministry, Business or Friends. You can change all the contact information to your personal information. This will update all the hot links, like email address, and URL to your personal Web page, as well as change the address, phone number, to your personal information. Then you can record your own personal voice greeting to what ever you like then copy your new files to a business card or full size CD and give it to your friends or business associates. Bussines Card CD weighs less than 1 ounce so you can include your new customized CD with a one page letter and it will only cost you the price of a first class stamp. Version 4.2.1 is fully integrated with Microsoft Accessibility options (text to speech). Enhancements in tools needed to create CD Roms. Converted internal voice to Microsoft Accessibility speech, reducing the overall size, without reducing content. Improved its overall simplicity.